Last September, the European Rosetta probe sent back pictures immortalizing a rare asteroid called Steins. Now, after in-depth analysis of data collected during the flyby, the small rocky body is starting to unveil its secrets. 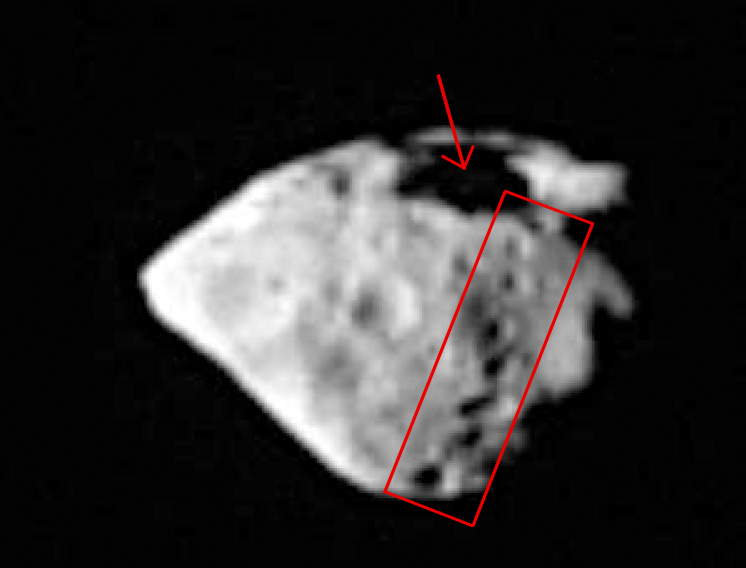 Compared to other asteroids observed by flyby missions, Steins is very small at a little more than 5 km across. Credits: Lucy McFadden, University of Maryland. "It really was worth going to see Steins!” affirms engineer Philippe Gaudon, Rosetta Project Leader at CNES. Steins is a rocky body gravitating like many others between Mars and Jupiter, but what sets it apart is its composition. “Of the 100,000 bodies in the asteroid belt, only 20 are like Steins,” says Gaudon. Scientists chose to fly by this unusual asteroid on the path of the Rosetta probe, on its way to comet Churyumov-Gerasimenko. The 1st pictures revealed a small diamond-shaped object 5 km across. Now, more details are emerging. 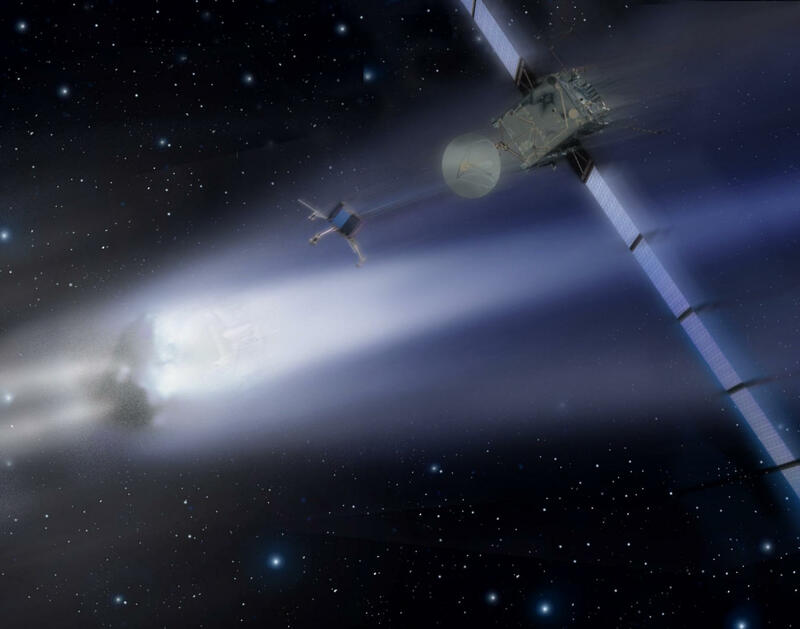 The Rosetta probe and the asteroid Steins. Credits : Ill./NASA. 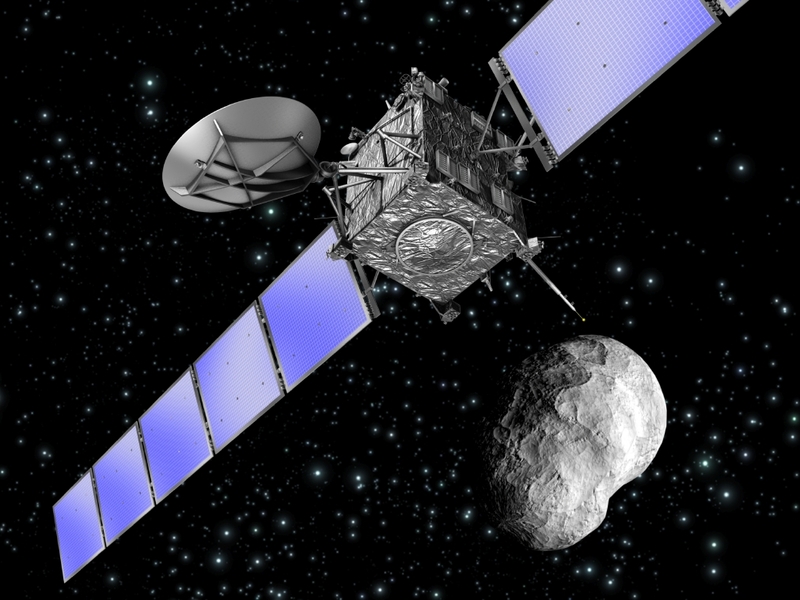 Rosetta is the 1st probe to fly by an E-type asteroid. Credits: OSIRIS/MPS/LAM/University of Padua. Steins therefore indeed belongs to the E category of asteroids - E for enstatite. “This composition was confirmed by the absence of any magnetic field,” adds Gaudon. The data gathered by Rosetta and its Philae lander show that Steins has no exosphere, that is, no residual atmosphere, and no satellite. Temperatures are in the region of - 50°C on its sunlit side. 18 of the instruments on Rosetta and the Philae lander were designed, wholly or in part, by French laboratories. Credits: ESA. The large surface crater spanning about 2 km and the string of smaller craters lower down are the remnants of a very violent impact between Steins and another asteroid. Credits: OSIRIS/MPS/LAM/University of Padua. But that’s not all Rosetta has discovered. The pictures of the asteroid point to its chaotic history. Certain meteorites that fall to Earth, called aubrites, have a composition very similar to Steins. Scientists think it likely they could be the result of this type of collision between E-type asteroids. This hypothesis still has to be confirmed, as does the age of the impact crater on Steins, estimated for now to be 100 million years. The reason scientists are so interested in asteroids is that they formed at the same time as our solar system and gave birth to the planets. In July 2010, Rosetta and Philae will be pressed into service again to take pictures of another asteroid called Lutetia. “Lutetia is a large asteroid 100 km across that is going to tell us a whole lot more!”, says Philippe Gaudon in excited anticipation.